With the 3-SPACE class looming closer and closer, my "at home" and "at work" are pretty mixed up. So again I'm printing at home for work. This time we have some resolution testers, so students can see how much it costs in print time to increase resolution, and what kinds of shapes do well even at low resolution. The duck part is from beekeeper's Ducky Swimming on Thingiverse. Settings: These testers are built for the Afinia H-Series 3D software, with .3mm fast, .3mm fine, .15mm fast, and .15mm fine. 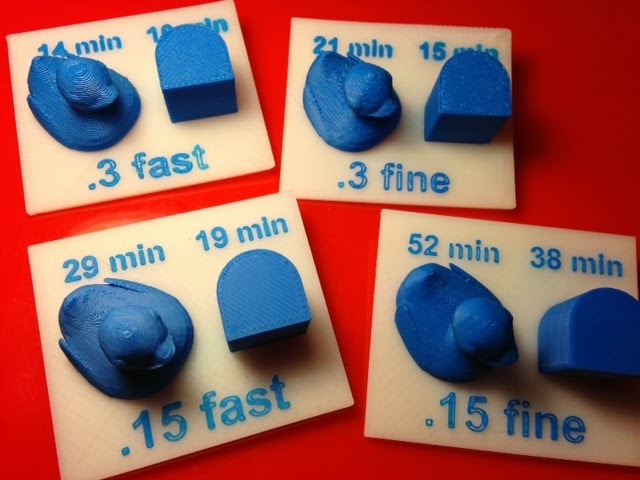 The build times for the individual duck and block are shown on the prints. The print times for each complete tester are the sums of the corresponding ducks and blocks, plus 10-35 minutes for raft and platform, depending on the resolution chosen. Technical notes: The Afinia 3D software tells you how long an object will take to print before it starts printing, which is how the listed print times on the models were obtained. A filament swap just after the raft and platform finish printing allows the two-color look. It's a pain because you have to pay attention in order to catch it at just the right moment, but it's really worth it for a nice classroom model. 1. Type the text you desire with the font tool in an Inkscape document. 2. Save the document as an .eps file, and make sure that "convert texts to paths" is checked. 3. Close the file ("close without saving" message is fine; choose that). 4. From within Inkscape, open the .eps file (press "ok" without changing settings). 5. Save again, this time as a "plain .svg" file (not an Inkscape .svg file). 6. From Tinkercad, use "import" to import your .svg text onto your Workplane. Voilà, we have tricked Tinkercad into accepting our text by making Inkscape wipe out its "textiness" and converting to an .eps path description of the text, then back to .svg format.